HT seeks WITH OVER 5,000 AGENTS IN NOCO, st love dy to jumpWHY LIST WITH THE FOWLER GROUP? Military helpful. CAT LOVER s cat owner. ed and willing •For several years we’ve had allyafond successof rate of 95.8% xedo cats. list to sell ratio is 100.9% be•Our answered. the MLS average is 96.2% urrr-fect match. A Dream Home Deserves a Dream Mortgage. A GOOD NIGHT SLEEP IS IN YOUR REACH AND YOUR HEALTH IS WORTH IT! Coloradoâ&#x20AC;&#x2122;s Board Certified in Orofacial Pain, Credentialed in Dental Sleep Medicine with 30+ Years of Experience. SPECIALIST REGAIN FUNCTION, END LIMITATIONS AND REST WELL. Specializing in the treatment of TMJ Dysfunction and Sleep Breathing Disorders, Dr. Mark J. Barnes has transformed the lives of countless patients providing long lasting solutions through identifying the root cause of pain while managing the secondary symptoms. Custom and highly specific orthotic appliances are provided for differing TMD conditions and offer an alternative to CPAP for patients suffering from snoring and Sleep Breathing Disorders. *ask agent for details, restrictions apply. As a current resident in Northern Colorado I am fully aware of the current market trends and what it takes to get a great deal on a listing or get top dollar for your current home. When it comes to getting the job done right, you can count on me! I have a lot of connections within the Northern Colorado area. One thing you will get with me is a personal relationship, In the end, that goes a long way. A BETTER AGENT. A BETTER EXPERIENCE. You can’t overestimate the influence of a real estate professional when you’re buying or selling a home. The best agent makes all the difference in terms of how quickly you’re in your new house, and negotiating a deal that makes the most of your investment. I promise to be that agent, expertly guiding you through every step of the process and making the road to your new home a smooth one. “Heather was our real estate agent during our first home purchase and the process could not have gone smoother and it’s all because of her. She was available for any questions we had (and trust me, there were A LOT). She made sure to advocate for us every step of the way to ensure we didn’t get taken advantage of and that we got all the information on the house we could possibly need. Heather is outgoing, kind, and will make your home-buying process a pleasant one. - Justyna B.
H I G H ! Euflora is a cannabis boutique that features greenhouse grown craft cannabis, edibles and concentrates. Informally dubbed “The Apple Store of Cannabis.” Euflora offers a unique and comfortable experience, free from the confinements of a traditional dispensary. Our Chic modern style combined with technology driven layout allows you to browse freely. It is an experience unlike any other dispensary and one which makes our customers feel immediately at home. Receive a joint for ¢10 for every $30 you spend at any of our locations*. 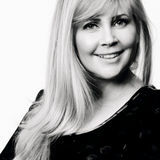 ABOUT THE EDITOR-IN-CHIEF Trisha Ventker is an author, photographic artist, branding and social media expert, publisher of ELIFE, NoCo, Denver Colorado magazines. She also finds promoting and bringing local businesses together very rewarding and is the founder of NoCo Mastermind, a networking group for small business owners and entreprenuers. She is best known for her first book Internet Dates From Hell which is selfpublished by Ventker through iUniverse. It has since had the movie rights to it optioned by Paula Wagner. Trisha is also one of the first Indie Book authors to have a book optioned for the big screen. Trisha is originally from New York City, presently residing in Erie, Colorado for the past 11 years, with her husband and son. NoCo magazine offers businesses the most cost-effective way to reach consumers virally in Northern Colorado. NoCo is published by Ventker Media Group. All editorial material, including editorial, comments, opinion and statements of fact appearing in this publication, represents the views of the respective authors and does not necessarily carry the endorsement of Ventker Media Group. 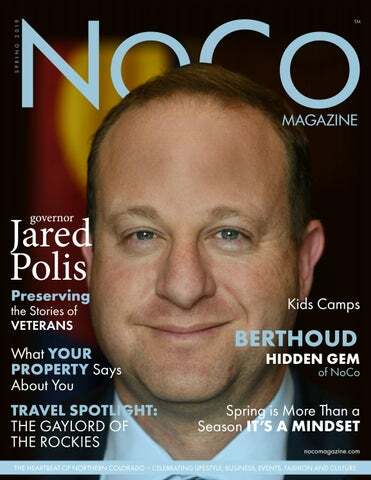 We had the honor to meet and interview Governor Jared Polis a few weeks back. Governor Polis was welcoming and down-to-earth. Jared Polis is a politician, entrepreneur and philanthropist serving as the 43rd Governor of Colorado since January 2019. As a member of the Democratic Party, he previously served on the Colorado State Board of Education from 2001 to 2007 and was the U.S. Representative for Colorado’s 2nd congressional district from 2009 to 2019. Polis was elected Governor of Colorado in 2018, defeating Republican Walker Stapleton. NoCo: Tell us what your plans are for the next six months to a year. Governor Polis: We are very much focused on getting done what I ran on which is free full day kindergarten, saving people money on healthcare, putting the state on a pathway to more renewed energy opportunities for cleaner air, saving consumers money and reducing special interest tax expenditures and to be able to reduce income taxes for families. We also have to run all the agencies of state government which we planned on doing a customer-centric way really focusing on how we can serve people more efficiently and better. NoCo: What type of community outreach are you providing? Governor Polis: We do everything from meeting at town halls with local legislators to visiting areas we want to learn about and focus. We visited a school in Littleton yesterday that has a school breakfast program and also full day kindergarten. We’ve been already been to Fort Collins and Greeley and all across northern Colorado for a number of different events. NoCo: What is one of your biggest challenges in Colorado? Governor Polis: Preparing for disasters, itâ&#x20AC;&#x2122;s not a question if we will have a fire, itâ&#x20AC;&#x2122;s when and where. We always have to be on guard for danger. NoCo: What have you specifically planned for the Northern Colorado region? Coloradans can benefit from free full day kindergarten saving families $300-$400 a month. I am invested in our institution of higher education like UNC and CSU. I met with the CSU student government last week. We are also focused on how we can have more commuting solutions including bus, rapid transit and rail from Northern Colorado as well as focusing on working on the Highway 25 lane expansion. When selling residential property, there are factors that affect the real value, such as location, homes size and age, finishes, school standardized test scores and again - location. However, there is another valuable tool for getting best-priced offers, and that is the perceived value of the property, meaning - does the home present itself in a manner that makes a potential buyer feel like you have maintained the home in good order over the years? A PHOTOGRAPH OR PHOTO IS AN IMAGE CREATED BY LIGHT FALLING USUALLY PHOTOGRAPHIC FILM. there or close by. Clean it! Buyers often stand there when viewing a home. Get brighter light bulbs than normal. Light and bright is good! Finally, hardware on cabinets is preferred which matches either the sink plumbing or light fixture finish. It ties it all together for a finished look. 3) MASTER BED AND BATH This is where the buyer will sleep and spend many hours in your previously owned house. It must feel comfortable and clean. Display a comforter that is not highly patterned but matching the sham pillows. Clear out all extra furniture that you can and get your closet looking sparse, orderly and appearing as spacious as possible. In the bathroom display new towels, clear off all personal care items, remove rugs by toilet, sink and shower. Last - thoughts go back to the â&#x20AC;&#x153;walk upâ&#x20AC;? to your home. Renew mulch and trim back hedges and trees that are overgrown. Curb appeal and the walk up to your home matter. Happy Selling! ABOUT LINDSEY Lindsey has been selling real estate for over 14 years and works in her family agency with over 40 years of real estate experience! It’s in her blood. Her expertise is in new construction, she knows the ins and outs of the building processing has worked closely with superintendents and trades. Lindsey has great experience with land deals, and resale homes as well. Lindsey’s passion is to hear people, what they truly need and work her hardest to deliver on these needs. Your home is where you share you most important moments and she’s going to be sure the journey to get you to your new home or sell your existing is a wonderful one. Lindsey has 5 beautiful children, a hugely supportive husband and a lively farmette filled with all sorts of animals, lots of laughter and hard work. She loves living in Erie and believes in a true sense of community and making things beautiful. She is so excited to get to know you, hear your heart and help you with your real estate needs!!! BUSINESS: Berthoud Inn & Events This award-winning 1888 victorian inn sits in an idealic country setting. Amazing views to the front range of the Rocky Mountains from Berthoud Inn and Events. Relax and refresh in themed guestrooms. The Art Deco is a guest favorite with clean lines and turquoise décor. Each room is en suite (private bathrooms) ensuring guest privacy. Mark, the owner and innkeeper, really outdoes himself with a delicious complimentary breakfast. Having been in the restaurant business, each day is creative! Come and visit us for a unique and memorable experience. PROGRAM: Experience Berthoud Experience Berthoud is our newest program focused on educating our community and businesses that want to do business in Berthoud, people who may want to relocate or move a business to Berthoud and to encourage volunteers to step up in our community. Each program is different than the one before. This is designed for repeat registrations as well as stand-alone registrations. Would you like to learn more? Visit www.ExperienceBerthoud.com for more information. ORGANIZATION: Berthoud Area Chamber of Commerce The Berthoud Area Chamber of Commerce is comprised of one of the hardest working, competitive, friendliest and innovative Chambers in Northern Colorado. Our team (Board of Directors, Ambassadors, Executive Director and staff) understands the importance of maintaining an organization that puts our member’s, constituent’s, and supporter’s first. We are here to serve them, we want to see positive growth in their organizations, and we have extremely valuable resources ready for their interests. We are looking forward to serving you in 2019. To learn more about Berthoud, please visit the town's website by clicking here. As a 19 year Berthoud resident, Christine is a Northern Colorado real estate expert who has extensive newbuild knowledge, offers pre-marketing counsel, staging strategies, high quality comprehensive marketing tools and believes in client focused communication and care. T.O. MAIN LEVEL PLATE 109' - 1 1/8"
T.O. MAIN LEVEL SUBFLOOR 100' - 0"
T.O. FDN. WALL 98' - 9 7/8"
The Information shown on this document represents copyrighted intellectual property. Reproduction and/or distribution is not permitted without the prior consent of Lodestone Design Group. Bedroom 3 Cpt. / 8'-8" Clg. 13'-5" x 12'-8"
Cpt. / 8'-8" Clg. 31'-2" x 19'-4"
Cpt. / 8'-8" Clg. 11'-10" x 13'-6"
Cpt. / 9' Clg. 12'-7" x 14'-7"
Cpt. / 10' Clg. 12'-7" x 7'-5"
Tile / 9' Clg. 10'-3" x 11'-2"
BERTHOUD LAKE ENCLAVE - LOT 1 REPLAT BETHOUD, CO.
Cpt. / Vaulted Clg. 14'-6" x 14'-0"
60" DBL. SIDED GAS F.P. T.O. MAIN LEVEL SUBFLOOR 100' - 0" T.O. FDN. WALL 98' - 9 7/8"
Rocky Mountain National Park are within a scenic hour’s drive. SITE PLAN SCALE: 3/16" = 1'-0"
LOWER LEVEL PLAN SCALE: 1/4" = 1'-0"
You can also call for assistance with a purchase or refinance. BOARD & BATTEN SIDING 12" O.C. serve our community and are a rich part of Berthoud’s fabric. THE NEW IMPROVED WAY OF INSURANCE 22 years providing Colorado and the Front Range the best insurance solutions As an independent insurance agency, we offer MORE choices for your insurance needs. We are not limited to one compnay, instead we search multiple insurance companies for your situation and provide solutions and options. SPRING 2019 EVENTS The CIty of Fort Lupton invites you to join us for our upcoming events! Also,Â save the dates of June 7th for the Jacobs Fore Youth Golf Tournament, the Independence Day Celebration, and upcoming movies in the park. VISIT WWW.FORTLUPTONCO.GOV FOR MORE INFORMATION. about the artist | rebecca floyd I’m an artist and photographer living in Richmond, VA, with my husband Dan, our son Noah and our dog Arlo. When I first became a mother and our house began filling up with toys, I couldn’t help but notice that all the dolls were so happy. And while there’s certainly nothing wrong with being happy, I wanted my child to know that it’s okay to feel sad too. The problem was, sad dolls didn’t exist. So I decided to make one. It was just a couple of socks and some thread but my son carried it everywhere he went. And suddenly, his friends’ moms began asking if I could make one for their children too. Then a friend of mine whose mother had just been diagnosed with cancer asked if she could have one and I realized, there is a need for a more, shall we say, empathetic type of doll. So I created Frowny Faces, a collection of handcrafted dolls, each with its own unique design. I hope they bring you joy or at the very least, a bit of empathy. Because life isn’t always easy. And Frowny Faces get that. BUILD YOUR BUSINESS WITH US! Join us at our Monthly Luncheons! We have over 45% of our Membership attending each luncheon. Fort Lupton Ambassadors: Every month the Ambassador team hosts an informal and powerful networking event. Come for a cup of coffee and leave with business tips and new friends. Milliken Events Committee Johnstown Jingle The JMCC also hosts ribbon cuttings, business after hours, networking groups and much more. Check out our website to see all our events and follow us on social media for event updates. Spring is my favorite season of year. It’s the time when everything returns to life after being so dark, dormant and cold for what feels like forever. Spring is the promise of good things to come. The frozen ground begins to thaw, and the Tulips, Daffodils and Irises begin to poke their leaves above the dirt. It is a glorious time when most if not all things are renewed. The promise of warmth and life becomes so prevalently present heavy in the air, as does the opportunity to start anew is evident. The thing about spring is - is that it’s so much more than just a season. It should not be limited to only existing between the months of March and June. It’s not just a season! It’s a feeling, a mindset and a way of life - one that we should grab onto with both hands, remembering it throughout the rest of the year. So often in life, we can only see what’s happening at each very moment. If we are in the season of winter, some days it’s hard to imagine that the Spring will ever come. What Spring does is remind us that there is always hope. No matter how hard things get, there is always the promise of a new day of not a whole season. No matter how frozen the ground may be, the sun WILL appear and cast its rays upon you. We need to remember that we have an “eternal spring” waiting within us. Nothing is forever! Sometimes, we experience the feelings of multiple seasons in a single day. We may experience the sweltering heat of summer inevitably and patently taking us over, or the depths of a dreary and isolating collection of winter days. We may feel the crisp comfort and coolness of fall or the ending of something we wish would not. Perhaps, conversely, we should consider the joy, excitement and hope of spring. We have the ability to access the hope for a bright new day, even in the depths of the proverbial winter. Don’t lose sight of it.! Remember that it’s there. Assuredly, spring will arrive; we can be just as sure that things in our lives will also always turn around. That, there will always be the promise of life, hope and a new season to revive the things that have been dormant for far too long. ONLY WEEKS AWAY... ARE YOU READY FOR SUMMER? FREE EXAM for Kids Under Three* (303) 650-0310 14697 Delaware Street, Suite 210, Westminster, CO 80023 *Applies to new patients only. Offer may not be valid with insurance benefits. What are YOU doing on Wednesday mornings at 5:45? Still snoozing away, starting to slowly greet the day, or… bouncing around Old Town with a bunch of energetic goofballs?! Every Wednesday morning, a group of folks gather at Old Town Square in Fort Collins. They start off with a short jog, then meet back at the square to chant, bounce, and get straight into a workout. But more than that, they are there to grow a community around accountability, encouragement, #freefitness, and having a good time. This is our group, and we call ourselves “Wednesday Project FTC”. The idea started as an opportunity to get out of our ordinary workout routine and comfort bubble, branching out to try some new things, and finding more fun-loving folks. In just over three years of leading our group outdoors every Wednesday, we learned that you CAN make new friends as an adult, all while crab-walking around, giving celebratory hugs and hi-5’s after a job well done. Then you’re off to share the good vibes and photos with the folks in your “real world,” only to meet back next week and do it all over again! Our concept is simple: folks of all different backgrounds, fitness levels and goals get together for the same workout at their own pace. Some workouts are with a partner, some activities are just like elementary school gym class (no dodgeball, we promise). Strangers learning names and faces become new workout friends, make plans to hit up an afternoon run club, grab patio beers at a brewery some weekends and hopefully bring more new friends to the next workout. So why 5:45am on Wednesday mornings? We feel afternoons are for happy hours, family matters and kids’ soccer games. When our workout wraps up at 6:30am, you’ve got the rest of your day to do what you need to do. What Wednesday Project FTC hopes to become is an official November Project tribe, a network of nearly 50 groups doing this same thing in cities around the world, backed with the support of their sister cities to help recruit, challenge, support and encourage each other, even when they’re thousands of miles apart. Being on that larger stage requires us to build our recruitment numbers and set some big goals—how does a stadium workout at CSU sound? With all the fitness options that NOCO has to provide, we hope you’ll add our workout to your to-do list. We’ll see you at your next yoga/cross-fit/ spin class/zumba dance-a-thon/marathon as well, because we feel our group is the perfect complement to all, and will surely leave you fully energized, encouraged and ready to pay it forward. Leave your money at home, bring your best self and your best friend, get ready set to sweat, carpe your diem, and crush your goals! All you have to do is #justshowup. For updates on their weekly #freefitness workouts, search for and follow Wednesday Project FTC on Facebook, Instagram and Twitter. Outside of Wednesday Project FTC workouts, Hans is a suburban yeti, craft beer slayer, husband and Fort Collins father of two. If no one is asking WHO DOES YOUR HAIR? ASK us about out monthly VIP membership $50 facial and 10% OFF products! 340 Lashley, Ste 140 Longmont bfskinspa.com 303.
alive Be yourself. Be free! What better way for your child to express themselves than through the joys of dance. It is our goal to create a welcoming environment where every student regardless of ability or skill level can learn, be confident and above all, have fun while nurturing a love and respect for the art of dance. We offer classes in all styles of dance technique in our non-competitive environment. We invite you to step into the magical space of DanceSpace Performing Arts Academy. The premiere Front Range Dance Studio. It is the mission of DanceSpace Performing Arts Academy to provide an environment promoting self-worth, self-discovery, and growth. Dance lessons are life lessons and life goals can be achieved through the tools gained from dance education. 40 minute workouts at both Orange Theory Fitness and Pure Barre plus a run that includes a free smoothie from Colorado Nutrition! HIIT Workout, Yoga, and Running, plus Sponsors will joining us at New Belgium with giveaways and demos! a better value, smaller class size, flexibility and affordability in the trade school sector. As the demand for better value and superior training grows, look into all of the potential options available. If a career in Esthetics is in your future, contact Suzi Dennis at 970-371-0494. Create something beautiful in the beauty industry! Suzi Dennis, LE, CMPE, CMC brings 20 years of healthcare experience and knowledge to the esthetics world. Owning a Med-Spa in Longmont, CO where she practices her passion for skincare. An idea I have come to love is that of eating and drinking seasonally. I’m not only referring to foods that are available and in season, I’m talking about eating and drinking foods as they relate to holidays and events throughout the year. While most of the foods and beverages eaten during these times most likely stemmed from seasonal availability, I prefer to think of the foods as they relate to holidays and events. Who doesn’t enjoy grilling burgers on the 4th of July, roast turkey and stuffing on Thanksgiving, or corned beef and cabbage on Saint Patrick’s Day? Sometimes it’s a religious correlation, sometimes a national holiday, or simply a natural abundance of some type of produce that spurs these types of eating and drinking traditions. Whatever the reason, I love it all. All that being said, one of my favorite seasons of eating is the time around Mardi Gras in early spring. In the first few months of the year, most people are coming off the heavy food of the Thanksgiving-Christmas-New Year holiday season and looking for healthier food options and working to maintain their New Year’s resolutions. While this may last for others, come late February to early March one of my favorite food traditions comes about: Mardi Gras. This is often the death blow to me if I am still holding on to healthy eating resolutions. While originally a Catholic religious tradition brought by French Cajuns celebrating the last binge before the start of the Lenten fasting season, it has grown and expanded to have traditions that are appealing to a broader audience. This celebration wouldn’t be complete without consuming the foods and beverages associated with Mardi Gras. Since French Cajuns brought this holiday to America, it’s only fitting that this it relies heavily on their food traditions. As Mardi Gras normally falls in early spring, weather tends to still be on the cooler side. This lends itself well to some of the heartier dishes associated with Cajun cuisine such as gumbo and etoufee. Seafood is also in season this time of year so shrimp and oysters (the latter being famed for being best in months with the letter ‘R’ in them) are a good option. Think of shrimp boils, oyster po’boy sandwiches, and seafood soups and stews. Cajun tends to be an intense flavored cuisine, so it’s naturally very satisfying in cooler months when we are craving something warm and deeply nourishing. While sometimes mistaken for being blazingly spicy, it’s more of a deeply flavored cuisine utilizing a plethora of aromatics, herbs, and spices, and not just heat. Furthermore, it’s a great way to celebrate what could arguably be one of America’s only native-born cuisines. That’s right, just like jazz and basketball, Cajun cuisine is a purely American creation, or as close as you’ll get from a culinary standpoint. Being someone who very much loves things to be in their element, I even recommend listening to some New Orleans jazz while you settle in with some Cajun food and a beverage of choice and celebrate this time of year and tradition. Try my recipe above for a fun take on the classic shrimp boil, but with everything being cooked on the grill. This recipe is great for a mild sunny day in early spring when you’re craving a cookout. Directions: Boil potatoes in salted water until softened and approximately ¾ of the way cooked through. Let cool. Mix sausage and shrimp in a bowl and cover with 1 tsp. olive oil and 1 Tbsp. of seasoning. Thread shrimp and sausage on skewers alternating every other one. Mix all vegetables in a bowl with 1 tsp. of olive oil and remaining 1 Tbsp. of seasoning. Thread vegetables on skewers alternating every other one. It is important to keep vegetables and meat/seafood separate as they will cook at different speeds. Heat gas or charcoal grill to a medium-high heat. Grill skewers flipping every 2 minutes until shrimp and sausage are cooked through and slightly charred (810 minutes), and the vegetables until cooked through and charred (12-15 minutes). Serve with a beverage of choice and plenty of napkins. Enjoy! Brady Stewart, owner of J. Brady Seasonings LLC started the company in 2017 out of his home in Fort Collins. You can find J. Brady’s at multiple retailers throughout CO and online. Visit their website at www.jbradyseasonings.com, where you can find recipes and info on where you’ll find them next. places in Northern Colorado, less than 30 minutes from Downtown Denver, and only 10 minutes from Denver International Airport. The sheer scale and awe-inspiring majesty of the Rocky Mountains has captivated visitors to Colorado for hundreds of years. But there’s never been a resort to match the epic grandeur of the Rockies. Until now. A few months ago, the Gaylord Rockies Resort & Convention Center opened its doors as the largest combined resort and convention center in Colorado. The resort is the fifth Gaylord Hotels® property and one of the largest resorts in the world to debut under the Marriott International brand. You don’t realize how large the resort is until you actually drive up to it. Passing it from the tollway on my daily commute doesn’t do it justice. As you approach the resort, you are greeted by beautiful bronze sculptures of running horses, a theme that can also found in the Convention Center in abstract wall art. The canopy at the main entrance is of such an enormous scale that you could probably park two dozen Greyhound busses under it. Entering through the front doors into the Lobby is quite dramatic, but nothing compared to the awe-inspiring Grand Lodge that lies beyond. The resort’s interior design and décor is modeled after aspects iconic to Colorado and authentically captures a local sense of place. The early afternoon sun was streaming in through the massive glass curtainwall at the far end of the Grand Lodge and filled the entire space with beautiful light. that included a mixture of sushi and a variety of appetizers and small plates. Our 12-year old is typically a very picky eater, but truly enjoyed everything that we had ordered. I can highly recommend the Queen City Roll, Chicken Lemongrass Skewers, and Korean BBQ Pork Ribs. For desert we opted for the Yuzu Meringue Tart, which as absolutely incredible, and our son’s favorite, Mochi Balls. Feeling quite satisfied from an extraordinary meal, we went on a brief walk before heading up to the room to change into our bathing suits. Well my son and I that is. My wife decided to enjoy the comfortable bedding in our room and just relax and “unplug” from a long week of sitting in front of her iMac, managing social media for her clients, designing logos, and working on her three online publications of ELIFE magazine, Denver Colorado magazine, and this issue of NoCo magazine in which you are reading this article. Bathing suits on, we raced down to the pool, as we had been looking forward to enjoying the waterslides throughout our earlier dinner conversation. I lost track of how many times we went up the stairs and down the slides, it was so much fun. We then spent time in the main pool area, where my son was practicing all kinds of underwater acrobatics, as well as showing me his “Cannonball” skills. Eventually we made our way to the large hot tub and soaked our weary muscles and enjoyed the massaging jets. Before we knew it, 10pm had arrived and the pool area was closing. We headed back up to the room, took a quick shower, and jumped into the cozy beds. It wasn’t long before all three of us fell into a deep slumber. This turned out to be one of the best nights of sleep in quite some time. For once, we had not bothered setting our alarms and slept past 10am. Feeling rejuvenated but still wanting our morning caffeine fix, we decided to head down to the Cocoa Bean. Having had such a great dinner, we weren’t too hungry and decided to have a variety of fresh bakery items to accompany our different caffeinated beverages ranging from tea to latte to Frappuccino. While my wife and son were finishing their drinks, I decided to take a walk down to the adjoining Convention Center. I was truly amazed by the size of it and the number of meeting spaces there were. You don’t realize how large it is until you start exploring. I may have walked a mile before returning to the Cocoa Bean, and I had only seen a portion of the Convention Center. Unfortunately, all good things must come to an end and it was time for us to check out. All in all, we had a delightful stay at the new Gaylord Rockies Resort & Convention Center. Convention Center. Resort and Local Activities SummerFest featuring Wonderland Adventures: From Memorial Day (5/24) through Labor Day (9/2), Gaylord Rockies Resort invites guests to experience the Lewis Carroll’s storybook classic with a Colorado twist during the property’s “Alice’s Adventures in Wonderland” 2019 SummerFest celebration. A “splendiferous” event unlike any other, this immersive guest experience is a season-long, family-friendly celebration of summer fun complete with whimsical costumes, rock n’ roll music, pool parties and more. Cheshire Cat’s Colorado Adventure Scavenger Hunt: Take a unique trip within and around the resort and learn about Colorado as you discover locations and fun clues along the way to help the Cheshire Cat locate his magical amulet to return to Wonderland. Escape Room: You’ve received an anonymous letter, inviting you to Hatter's Tea Room at Gaylord Rockies. Arrive to the Tea Party where your host awaits with an ominous, fun-filled riddle. The only way out of this never-ending Tea Party is to find clues to solve the riddle and appease your mysterious host together. Queen of Hearts Mini Golf: Tee up on the resort’s transformed minigolf course, perfect for golfers of all ages. Local Golf Courses: Green Valley Ranch offers an award-winning 18-hole Championship course, a 9-hole par-3 course, and a full range practice facility, is only 3 miles away. Buffalo Run Golf Course, 9 miles away in Commerce City and designed by renowned golf course architect Keith Foster, is an 18-hole championship course with lush rolling greens, expansive fairways and picturesque views of the Rocky Mountains and surrounding prairie lands. Gaylord Rockies Resort and Convention Center by the Numbers · The resort’s rustic, alpine charm features 1,501 rooms, including 114 well-appointed suites. Of the suites, there are 14 presidential suites ranging between 1,500- and 2,200-square-feet. Every room features high-speed wireless internet access, in-room coffee service, and in-room safe. · The 100-foot Grand Lodges’ centerpiece is a 75-foot-tall (eight stories high) atrium window offering spectacular views of the Denver skyline framed by the Rocky Mountains. · Dine formally or casually at 8 food & beverage outlets, serving steak and American, Asian and Italian fares. · Indoor and outdoor pools complete with a lazy river and three waterslides – a total of 22,000-square-feet of aquatic experiences at the Arapahoe Springs Resort Pool & Lazy River – as well as an arcade, miniature golf, bike rentals, pickleball and more. · A 75-foot viewing screen, the largest in the state, in the Mountain Pass Sports Bar – ideal for game day celebrations. · The property boasts more than 485,000-square-feet of exhibition, meeting, pre-function and outdoor space. · World-class pampering awaits you at our European-style spa - the 17room Relâche Spa and Salon, plus state-of-the-art fitness center and ice fountain, offer countless ways for guests to relax and recharge. Follow the white rabbit to explore never-ending excitement and create the perfect vacation experience including mini golf, the Hatter’s Escape Room, Alice’s Rockin’ Tea Party and water play for all ages. Mobile service staff for all your memorable events. No party is too big or too small. Vista Ridge Community Center has an atmosphere and many amenities to make your event everything you've imagined. Our venue overlooks a world class golf course and has one of Colorado's most beautiful mountain views. Not only does our views "wow" all that see it, it truly takes the cake. Ensure your gathering has the character and space it deserves. Our space possesses rich wood trimming and elegant stonework that will impress, while putting your guests at ease. For your culinary preparation, use our spacious kitchen, A beautiful deck , lawn and pavilion are perfect for your outdoor needs. Attorney, The Germany Law Firm P.C. and Deputy Public Administor, 17th Judicial District When clients ask us why they should hire us to prepare their estate planning instead of downloading a form off the internet or doing fill-in-the blank forms, I often ask “would you perform surgery on your foot yourself to save a few hundred dollars?” Everyone wants to make wife financial decision. However, preparing your will and other planning documents yourself may very well be penny-wise and pound-foolish. Yes, attorneys earn fees for preparing estate plans; however, they earn much more when litigating will contest, trust litigation or abuses of power of attorneys. When I teach classes about estate planning, I state that in a room with 50 people in it, if properly customized, each of their estate planning documents will look very different due to each individual’s family backgrounds, needs and financial situations. Attorneys are counselors at law, not just document drafters. Our job is to explain the pros and cons of documents that have a legal effect on a client. People sign legal forms that are downloaded off websites every day, but many of those people don’t understand what they are signing, or the power they are giving to another person. Elder fraud and elder exploitation has become a huge problem. This is partly due to potential exploiters and abusers having access to downloadable planning forms, which they can print off and put them in front of unsuspecting parents or grandparents, who may have cognitive impairment, and simply do not understand the consequences of signing them. May of our worst cases have involved elderly clients unwittingly signing deeds transferring their homes to a relative or putting a relative on their bank account and being financially wiped out. Another common issue occurs when people attend an estate planning seminar and are given fill-in-the-blank wills or powers of attorney to complete. Often, these documents do not account for unforeseen circumstances, and are not specific to each person’s individual situation. For your protection, we recommend not signing anything unless you fully understand it. If in question, see an experienced elder law, probate or estate planning attorney whose practice is in these areas of law. It may require some investment to have quality documents prepared but may save thousands of dollars in the long run. Susie Germany has been an attorney for more than 16 years. Licensed in both Alaska and Colorado, she has practiced in the areas of criminal litigation, civil litigation and domestic law in addition to elder law, probate and estate planning. COLORADO: THE NEW AMERICAN UFO GROUND ZERO?! None of us can argue the splendor and magisterial beauty of the great state of Colorado, from the rolling plains of the east, magnificent deserts of the south to the awesome breath-taking mountains to the north and west. Undoubtedly, our great state holds some of the most mysterious natural and “unnatural” phenomena from the odd sightings of Bigfoot up and down the range to the multiple witness accounts of ghostly apparitions from the scores of derelict coal and silver mines up and down Canyon Pass to Central City further north to The Stanley Hotel up in Estes Park. Lately, those isolated paranormal phenomena pale by comparison to what’s been noticed, not on lonely hiking trails, defunct mining areas or strange hotel rooms. The “strange” need not be bound to the land exclusively. Look to the skies, northern Colorado, and feast your eyes on some airborne oddities! There growing in number as we speak! Last July, for over 45 minutes did several Fort Collins residents capture on cell phone video “an amber light that dropped from the sky, stop abruptly, shoot out an object toward the ground, drop low on the horizon, hover and then disappear”. This was not a rarity in this part of Colorado, or for the most part, the entire state. Being the “Number 11” state out of fifty in our Union for UFO sightings is quite noteworthy! Since 2010, over 3,200 sightings have been recorded and reported in The Rocky Mountain State alone! One need only to go to the National UFO Reporting Center State Report Center for CO. website to shockingly find that less than two weeks ago on Oct. 4, 2018, witnesses in Littleton observed 3 sets of 3 lights in a triangular formation - one stationary, one moving slowly and the last moving rapidly - all at different levels! Even more shocking was the reported sightings even more recently in southern Colorado on Oct. 6, when others facing The Sangre DeCristo Mountains in Wallsenburg within a Navajo Housing Community saw inexplicable sights one night west of the Air Force Training Base. Ten more reported sightings across the state in September and nine others in August brings the total amount to twentyone sightings in a little over two months. Again, one might think that states like New Mexico and perhaps Arizona are the “grounds zero” for UFO sightings - not Colorado. One would only be somewhat correct, for again, Arizona ranks number 6 as New Mexico number 7. Conclusively, although Colorado does not report more unexplained sky visions compared to them, coming in at number 11, still puts our state at an 89% ratio more than the rest! As Adam Sandler says, “Not too shabby!” I would imagine that several conditions favor the “Big Three” western States for more than less sightings overall. The altitude of the mountains and the warmth of the deserts may allow the greater percentage of the sparsely populated states to witness and report more sightings than 47 other states, perhaps. Or maybe there’s more to it than that. Maybe the drastic difference between the ranges and the plains or desert lands attract these extra-terrestrial beings. Perhaps there are semi-precious commodities or “unnatural” resources embedded in these areas that we mortal humans couldn’t care less about, yet they, our far-reaching “space brothers and sisters” would do anything for!? Either way, let’s cherish that innocuous “Number 11” and revel in the fact that there are only ten other states that they favor more (or for the “glass half-full” people and the growing number of eternal optimists among us - 39 that they favor less). Kinda puts new meaning to the old imperative adage, “Heads Up!”. Heads up, Colorado! We’re ripe for sightings! Who knows, maybe next year at this time, we’ll be #10, and good old Idaho, #11, unless the alien culture increases its penchant for those wonderful potatoes the great state of Idaho’s famous for! Didn’t E.T. love French Fries in that great ‘82 film?